This book is available now. Available at major retailers (check “Other Retailers” tab below). Recommended by Library Journal, School Library Journal, Kirkus Reviews, Locus, Foreword Reviews, and Quill & Quire. Foreword Reviews (Fall 2016 issue) In this outstanding collection, nineteen established writers are asked to explore the borderland between mental health and mental illness. Since all of the contributors come from a science-fiction and fantasy background rather than a medical one, the results are anything but the same-old, same-old. The opening story, “The Culling,” depicts a heroine unquestionably sane by our own standards but deemed a mental defective and sentenced to death in the dystopian world she inhabits. Other stories, such as “Dallas’s Booth,” “How Objects Behave on the Edge of a Black Hole,” and “Living in Oz,” show ordinary people whose abnormal behavior is a realistic response to disability, isolation, and grief. Some of the strongest stories remain deliciously open to interpretation. In “Troubles,” a young Belfast woman recovering from a psychotic break sees and talks to faeries who make a convincing case for their reality, while in “The Weeds and the Wildness,” an aging, lonely person becomes an ecoterrorist in response to the “merciless” war waged by sinister lawn specialists bent on eradicating all that is wild and natural. Society is the patient in “The Age of Miracles,” which depicts a culture gone so overboard with talking, monitoring, and nagging appliances that only the Dalai Lama can maintain his sanity. The writing is excellent throughout, and even the few not-as-strong stories make for a good read. This is a unique collection that should attract readers of all genres. 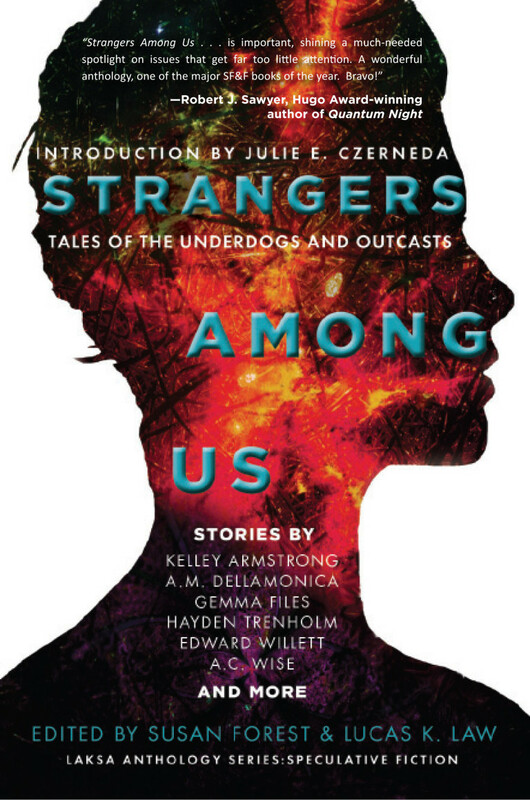 We recognize that not everyone has the resources to buy this anthology, Strangers Among Us: Tales of the Underdogs and Outcasts. Since mental health is such an important subject, please help us to reach as many readers as possible. Our dream is to have every library in the world having this anthology available for its library users.